I would like to see a finer control of text sizes in the project settings. Single digit Em settings is quite limited, but I am guessing this can be altered in the custom classes. 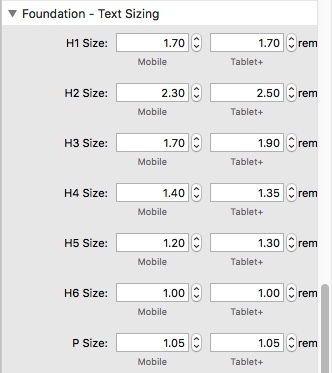 In Foundation I am used to setting font sizes in site styles, which can be altered with great accuracy using Rem according to category and device size. This offers great control over the appearance, while often helping to avoid headaches if you can slightly tweak the font sizes to avoid problems on an iPad mini for example.